This is the latest article in The 74’s ongoing ‘Big Picture’ series, bringing American education into sharper focus through new numbers, research and reporting. Go Deeper: See our full series. 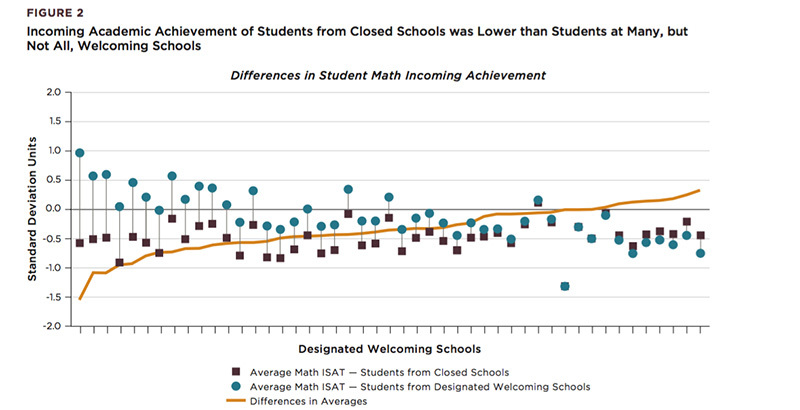 Mass school closures initiated by the Chicago Board of Education in 2013 led to declines in student math performance, according to research published last month. Now, following the expiration of a five-year moratorium on further closures, the district is preparing to shut down several high schools — and locals wonder whether authorities have learned the lessons of one of the most tumultuous episodes in the city’s recent history. Overall, students from 49 shuttered elementary schools and one high school fell roughly two months behind in math compared with their counterparts in other schools, a setback that hasn’t been rectified in the years since. Students and staff struggled to find their footing in new situations, while the leaders of the receiving schools complained that they didn’t have the time or resources to manage an orderly consolidation process, the authors found. Published by the UChicago Consortium on School Research, the study offers perhaps the most comprehensive look yet at the effects of shutting down a school and relocating its population. Past evidence has been mixed, though researchers generally believe that students can make learning gains after being relocated to better schools. The hope of spurring kids to greater achievement was at least a secondary consideration in Chicago’s closure wave five years ago, which was triggered by budgetary concerns. During the 2012-13 academic year, hundreds of mostly elementary schools were identified as targets for closure, precipitating months of public hearings where parents and students made emotional pleas to keep their schools open. But the drawn-out process doesn’t seem to have worked to the district’s benefit, one of the study’s authors said. Forty-seven schools were shuttered before the 2013-14 year, along with two more the year after, and roughly 8,000 students were placed into nearby “welcoming” schools. Notably, the overall quality of the welcoming schools seems to have been better: While 36 of the closed schools were previously in probationary status — the city accountability system’s lowest ranking — only 13 of the welcoming schools earned that designation. Conversely, 35 welcoming schools were considered to be in “good” or “excellent” standing; just 11 closed schools were in good standing, and none were considered excellent. But by the spring of 2013, even before shutdown plans were finalized, students in soon-to-be-closed schools had already fallen behind by 1.5 months in reading and two months in math. While reading scores eventually bounced back to where they ought to have been, given previous trends, math scores never did. What’s more, by waiting until May to vote on the plan, the school board left little time for school communities to prepare for a jarring exodus. For the report’s qualitative section, authors surveyed students and teachers from closed schools, who lamented the loss of their community and the feelings of dislocation that followed. Students struggled to make new friends in their first year, while faculty often said they were treated as outsiders. Staff and administrators at receiving schools, meanwhile, described a frenzied rush to integrate huge numbers of incoming kids and adults. In over a dozen cases, they themselves were required to move into buildings that had housed shuttered programs, which claimed precious days and weeks. Teaching materials were sometimes lost in the migration. The study was released during an eventful period in the history of Chicago Public Schools. In an analysis published last year, Stanford education professor Sean Reardon found that the district is improving at the fastest rate in the country, imparting six years of learning to its students in just five years of school. At around the same time, CPS alumna Janice Jackson rose to become the system’s latest CEO. The biggest challenge facing Jackson will be Chicago’s dwindling student population, which has dropped by roughly 70,000 over the past 15 years. To address that decline, the district announced the slow-motion closure of four under-enrolled high schools on the city’s South Side. Though the move has sparked renewed protests, UChicago’s Sartain says that Jackson seems to have internalized the lessons of 2013. Rather than shutting the schools down this month, the plan is that current students will remain enrolled through 2021, when this year’s freshmen graduate.